The Navajo Language Academy, Inc. This is a collection of materials that Professor Ken Hale bequeathed to the Navajo Language Academy, Inc.
Prof. Hale was a professor of Lingusitics at Massachusetts Institute of Technology and one of the foremost researchers of Navajo linguistics. 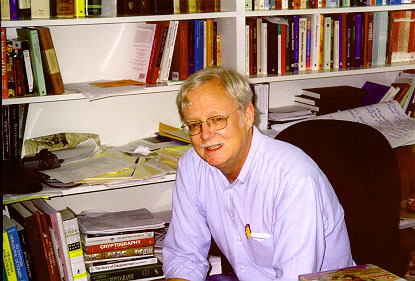 Prof. Hale's articles and notes related to his work on Navajo are housed at the McCabe Library at Swarthmore College in Swarthmore, Pennsylvania. His papers on general linguistics are housed at MIT. It was Prof. Hale's wish to make his Navajo materials available to Navajo linguists and to others who research the language. He chose to leave his collection to the NLA, Inc. under the care of Prof. Ted Fernald of Swarthmore College's Linguistics Department. The NLA, Inc. does not have a permanent building or permanent staff to maintain the archive. If this situation changes the archive will be moved to a location on or near Navajo country. To make the archive accessible our volunteer staff is gradually adding pdf files to this site. This project is finded in part by a Historical Archives Program grant from the Wenner-Gren Foundation for Anthropological Research. Get Situational Navajo and related works here! These materials were developed by Wayne Holm, Irene Silentman, and Laura Wallace. About Us | Site Map | Contact Us | ©2005 Navajo Language Academy, Inc.